We submitted this paper for publication in the Burlington Magazine but it was rejected because “the presentation of the material would mean the whole article would have to be re-written and edited” in spite of the fact that “It has interest and some merits”. We didn’t have the courage of reworking the text and go into another review process and decided to offer it, as it was, to the readers of plaisirstextiles.com to whom we humbly request their kindness in judging its content. We think it is a worthwhile contribution to the knowledge of the production of the embroidery workshop of El Escorial. 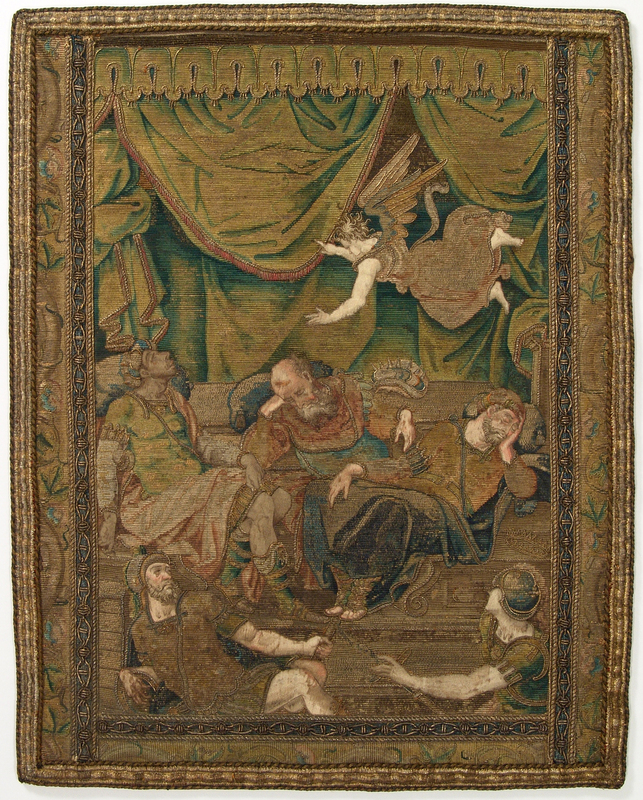 The Deutsches Textilmuseum of Krefeld, Germany, owns a magnificent embroidered panel  of 36,2 cm height and 28,7 cm widthrepresenting the Dream of the Three Magi when the Angel orders them not to return to Herod to announce him they have found Jesus, Figure 1. The panel is directly inspired by the text of Matthew (Mt. 2.12 ... And being warned by God in a dream that they should not return to Herod ...). In an interior with the background fully and richly decorated by heavy curtains hanging below a scalloped valance, a winged angel hovers above the three kings are sitting on a bench and sleeping while two soldiers are watching over them. The scene is framed on three sides by a very unusual braid formed by a chain with alternatively circular and oval links. The work is of a rare beauty because of the quality and the opulence of the embroidery. The whole panel is in the technique of shaded gold  (or nué), with split stitching (bouture ) for the flesh tints of the figures and the members of the characters. The braid is made using lines of cordonnet , made by twisted strands of gold filé, sorbec  of blue silk and silver strip, gold purl  and gold bouillon . In the Textile Museum’s catalog1 this work is supposed to be from the end of the XVth or beginning of the XVIth century and attributed to a Florentine workshop. From now on, this panel will be called the “Krefeld embroidery”. Louis de Farcy, in his seminal book on embroidery from the XIth to the end of the XIXth century, presents a fragment of an orphrey band  divided in two registers, given as Spanish from the early XVIIth century and, at the time of the publication (1890), belonging to the Spitzer collection, Figure 2. The lower register depicts he Annunciation: in a richly decorated interior where the angel Gabriel, on the left, addresses his message to Mary, on the right, in the presence of God surrounded by clouds and the dove of the Holy Spirit within a radiant glory. 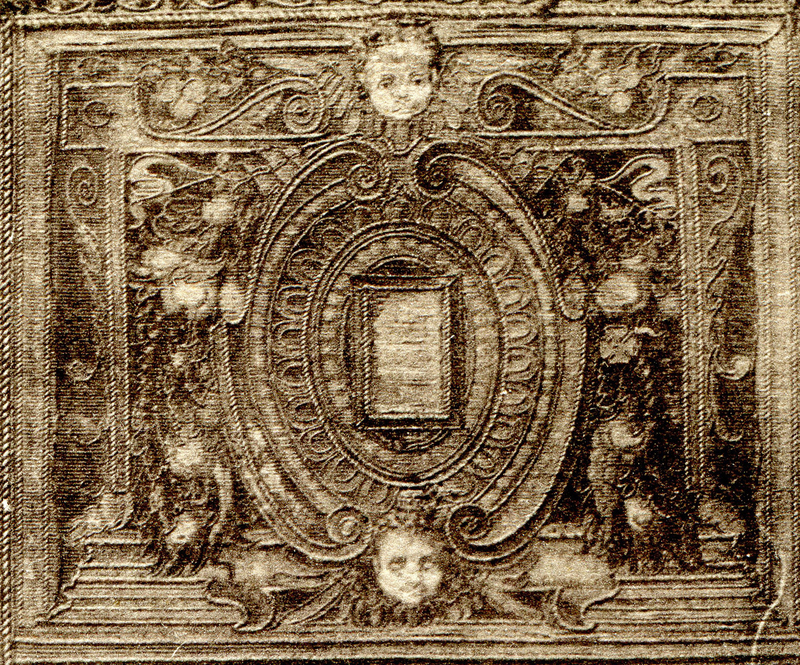 The upper register is a rectangular cartouche of « great beauty » framing a scrolling oval medallion with a cherub’s head in the upper and lower frame. The two registers are bound on the two sides and the bottom by three parallel borders: the thin inner and outer ones, with alternatively circular and oval links identical to those of the Krefeld embroidery, frame a larger one decorated with an undulating wine stem. As for the Krefeld embroidery the whole orphrey fragment is worked in the shaded gold (or nué) technique and considered a “masterpiece” by de Farcy8. The present location of this embroidery is unfortunately unknown. From now on this orphrey fragment will be called the “de Farcy embroidery”. 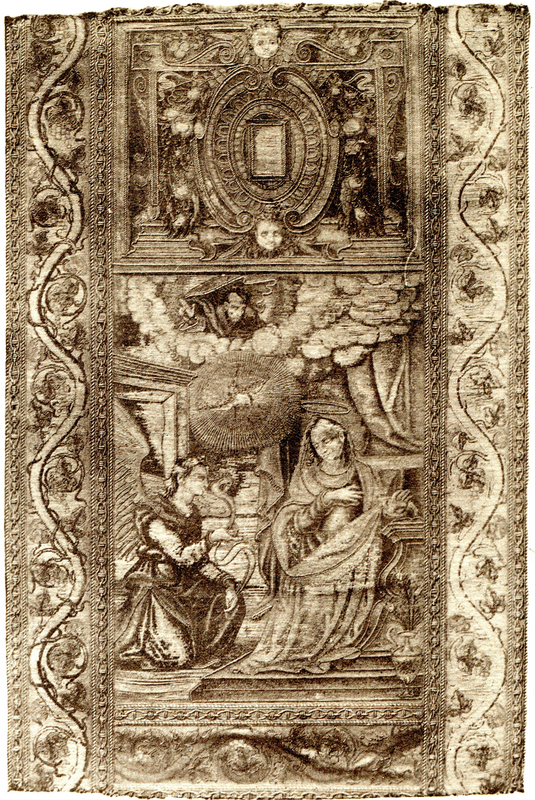 Figure 2 : The Annunciation, ancient Spitzer collection, published by de Farcy, given as Spanish and early XVIIth century,silk and gold thread embroidery, dimensions unknown, present location unknown. It is our purpose to show that these two embroideries are very fine examples of the production of the second embroidery workshop of the Monastery of the Escorial, near Madrid in Spain, active during the last quarter of the XVIth century, and that they are most certainly fragments of a dismembered ornament embellished with superb orphrey bands. Figure 3(a) shows an enlargement of the border of the “Krefeld embroidery” made at the level of the right arm of the reclining personage on the left representing King Balthazar. It can be described as follows: over the ground provided by the strands of couched gold filé and in the perpendicular direction are two parallel lines of cordonnet, made by twisted strands of gold filé, which frame a very thick chord obtained by braiding together four strands of gold filé. The same motif is repeated leaving a space in between where eight lines of sorbec of blue silk and silver strip are laid also on top of the laid gold ground. A chain or string of circular and oval links made with gold purl for the circular ones, or bouillon for the oval ones overlays the bed of sorbec. The circular links are filled with three or four short strands of bouillon. Two other short strands of bouillon positioned parallel to the laid gold are in the middle of the oval links. Finally, the links are united by a short strand of bouillon. To the left of this braid is a fraction of a decor of vine leaves, tendrils and branches worked in the or nué technique with a very fine cordonnet bordering the leaves. 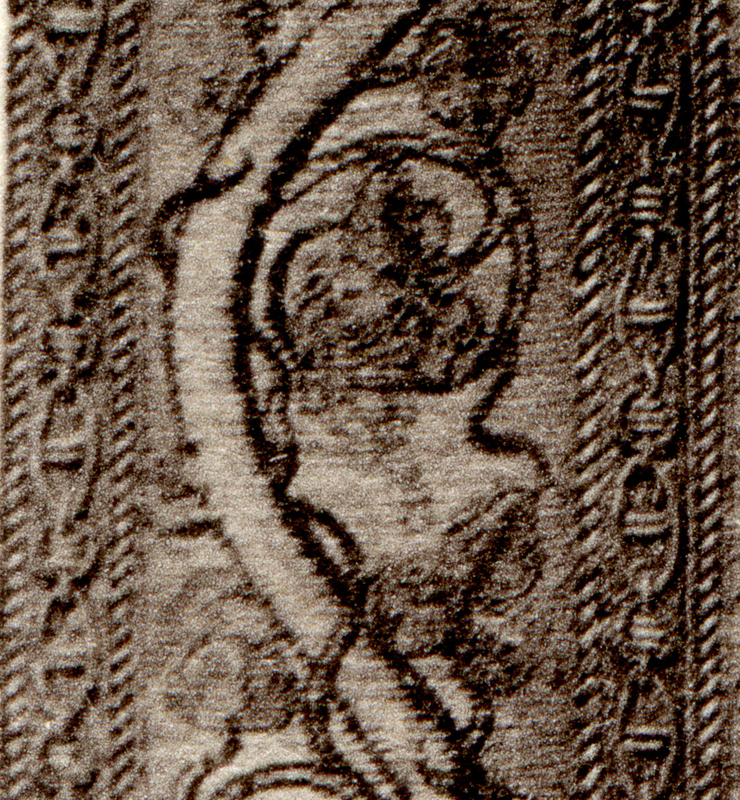 Even if the quality of the image in the de Farcy book is quite poor, we have reproduced its left border at the level of the angel’s head (Figure 3(b), detail of Figure 2). The two thin braids, with the chain of oval and round links bordered with lines of thick cord, are identical, both from the design and the technical point of view, to the one of the Krefeld embroidery. The vegetal design in between the two thin braids can be favorably compared to the Krefeld embroidery. It shows that, indeed, the latter is fragmentary since the border has clearly been cut down by about two thirds of its original width. However, the relative position of the vegetal elements - vine leaves, branches and tendrils - is the same and the scale of the design, measured by the number of round and oval links, is also extremely close. We can draw the following preliminary conclusion: both the Krefeld and the de Farcy embroideries were, most certainly, fabricated in the same, probably professional, workshop and belong to the same set of liturgical vestments. We will next consider the question of the professional workshop. The Treasury of the Cathedral of Le Puy-en-Velay , France, possesses a side of antependium  with the representation of the Return from Egypt, Figure 4, belonging to the Cougard-Fruman collection. Interestingly enough the arrangement of the piece in two registers edged on the two sides and the bottom by a large border is analogous to that of the de Farcy embroidery. The lower register is the representation of the Holy Family returning from Egypt. On the left, St Joseph, young and haloed, is carrying the Infant Jesus. On the right, Mary, also haloed, is embracing her mother Anne. Other figures, two men (one of which could be Joachim) and two women (possibly Mary's sisters) are present in the scene. It takes place within a structured architecture, presented in perspective, characteristic of the Renaissance, and punctuated with greenery. The upper register is filled in ornamental patterns with a cartouche of cut leather pattern topped and supported by a cherub’s head and framed with bouquets of flowers and fruit. 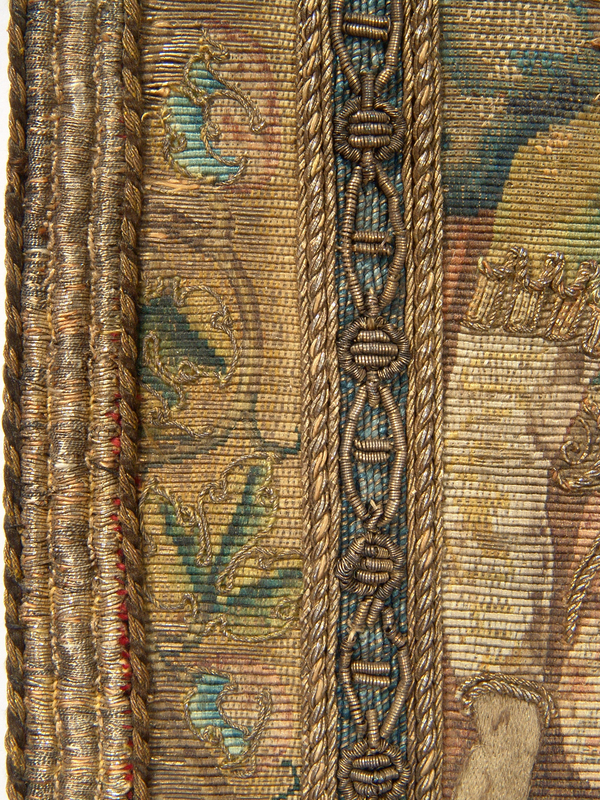 Finally, the border consists of an undulating wine stem, edged by an inner and outer chain of oval and round links as already discussed above for the Krefeld and the de Farcy embroideries. Let us compare the borders of the Krefeld and the de Farcy embroideries, Figures 3(a) and (b) to the one of the Le Puy embroidery, Figure 3(c). A few things can be pointed out immediately: first, both the de Farcy and the Le Puy embroidery have an identical design with only minor changes in the way the tendrils are twisted and the vine leaves are set along the undulating branch; second, the remains of the undulating branch of the Krefeld embroidery are very close to the Le Puy embroidery in design, colors and technical approach (or nué and a couched very fine cordonnet enhancing the border of the vine leaves), and third, the de Farcy and the Le Puy borders are nearly identical. There can be no doubt that the Le Puy embroidery was, at one time, part of the “rich rainment of the childhood of Jesus”  fabricated in the El Escorial workshop during the last quarter of the XVIth century10. Considering that the Le Puy, the de Farcy, and the Krefeld embroideries are all three edged with exactly the same border, besides few minor details, we can already state that the latter two embroideries belong to the same ornament and have been produced at the same El Escorial workshop. This is further substantiated by the fact that we know of a side of antependium representing the Flight to Egypt , matching exactly the Return from Egypt shown in Figure 4, still in the Sacristy of the Escorial and decorated with a braid identical to the one shown in the three specimens of Figure 3. There is also a hood representing the Adoration of the Magi with the same border and other ornaments with a similar but not identical decoration . Our next conclusion is that the de Farcy and the Krefeld embroideries were produced, most certainly, in the professional workshop of the Royal Monastery of the El Escorial little after 1577. As already mentioned in the Introduction, the scene of the Dream of the Three Magi when the Angel orders them not to return to Herod to announce to him that they have found Jesus, is very rare; we do not know of any other example in embroidery. This is not the only representation of The Three Magi among the El Escorial embroideries. 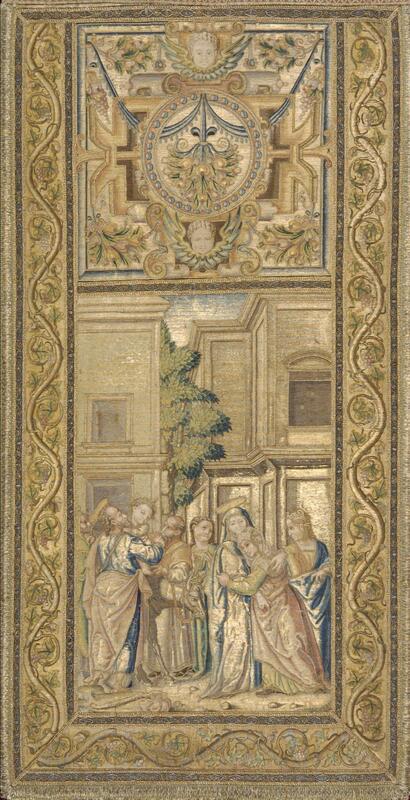 Following Junquera de Vega  and our own documentation, we know of: a chasuble with the Magi looking at the star  (Mt. 2.2); two sides of antependium, one with Herod getting the advice from the priests and scribes  (Mt. 2.4) and the other when Herod orders the Magi to go to Bethlehem  (Mt. 2.8); a hood with the Adoration of the Magi (Mt. 2.11), and a cope showing the Magi warned by the Angel (Mt. 2.12) (this is a duplicate of the Krefeld embroidery). Junquera de Vega mentions a few other duplicates, e.g. another Adoration of the Magi embroidered on a lectern veil; and The Kings following the star , the Magi stop at the place where is Jesus child , and Herod showing the Magi the way to Bethlehem  from the orphrey of two copes. Interestingly enough most of the drawings of the story of the Magi were produced at the workshop that Phillip II of Spain established to produce patterns for the embroidery workshop. More specifically, the drawing of the angel warning the Wise Men, attributed to Miguel Barroso by Junquera de Vega , is still in the El Escorial library . Our search of embroideries or drawings for embroideries issued from the El Escorial workshop with the representation of the Annunciation as in the de Farcy embroidery, Figure 2, has not been successful. However, the recent publication of a number of drawings  still in the library of the Monastery of the El Escorial allow us to demonstrate that they were intended for the decoration of embroideries and, in particular, two of them are directly associated to the upper register of the de Farcy embroidery. Figures 5 show the upper panel of the de Farcy embroidery, and the drawings, N° 127 and 129, from reference 24. It can be clearly seen that the frame of the de Farcy panel, Figure 5a, is strictly the same that the one of the drawing of the El Escorial, Figure 5b. We found from top to bottom: a central winged cherub‘s head with an horizontal garland of fruits and a scroll on each side, two vertical foliage scrolls ending by a bird of prey foot and a horizontal central winged cherub‘s head. The central portion of the de Farcy embroidery derives directly from the drawing N° 129 of the same reference, Figure 5c. The inside ellipsoidal cartouche enclosed within a frame of dots, egg-shaped motifs, two C-shaped scrolls and two fruit garlands kept by ribbons is absolutely identical. The only difference is the absence of the vertical rectangular motif in the middle of the panel, most certainly inspired by the one in Figure 5b. Interestingly enough all these drawings have been pricked for tracing like for many other drawings of the El Escorial workshop . As already mentioned, in the Krefeld piece the border with the meandering branch has been cut down by about two thirds of its width and replaced by an added embroidered braid. Because of this it is not clear whether this piece belonged to a side of antependium or an orphrey from a chasuble or a cope. However, a close look at Figure 1 shows that the lateral braids do not connect with the bottom braid like in the case of the side of the antependium shown in Figure 4. Also, the chasubles from the El Escorial, such as the one from the set of the life of Christ  and another belonging to the set of vestments said of "the childhood of Jesus" , show that the bottom panel of the orphrey ends like the side of antependium in Figure 4. This indicates that the fragmentary Krefeld embroidery can be neither a side of antependium nor the bottom panel of a chasuble or a cope. Nor can it be the upper panel of the orphrey of the front of a chasuble because, in that case, the upper border should be round to accommodate for the neckline typical of Spanish chasubles . We may thus deduct that it is either the top or the middle panel of the back orphrey of a chasuble, or one of the panels, but not the bottom one, from the orphrey of a cope. Let us now turn our attention to the de Farcy embroidery. Because of the arguments already developed above this embroidery cannot be the bottom panel of the orphrey of a chasuble. The presence of the rectangular cartouche on top of the scene of The Annunciation lead us to think that it can be either the top panel of an orphrey from the back of a chasuble or from one of the two side orphreys of a cope. A recent visit to the sacristy of the church of the Real Monasterio de El Escorial allowed us to measure the panels of the scenes (without the border) which decorate the back and front of a chasuble and the sides of a cope of the set of the life of Christ (see Table 1). The dimensions of the panel inside the border of the Krefeld embroidery, calculated from the dimensions (36,2 cm by 28,7 cm) of the full panel, are the same within few millimeters (31,6 by 20,6 cm) as those of the panel of the cope of the El Escorial. Most important, as already mentioned, during the same visit we discovered that the left orphrey band of a cope  belonging to the set of the life of Christ has a panel identical, with only very minor differences, to the Krefeld one, Figure 6. 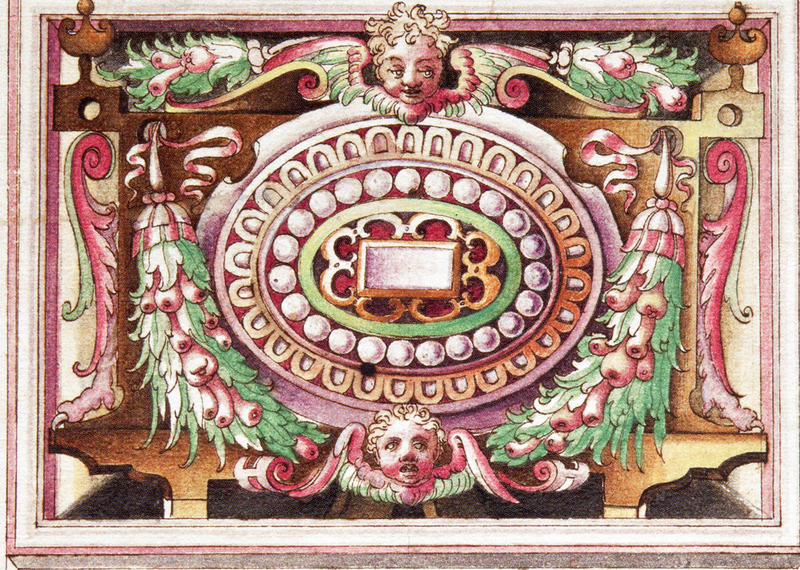 The design of the scene is strictly the same but the colors are different; in the Escorial panel the curtains are deep blue and the scalloped valance is red and has hanging tassels while in the Krefeld panel both the curtains and the valance are light green and the latter does not have tassels. What really distinguishes these two embroideries is the border showing a string or chain of circular and oval links in the Krefeld panel instead of a thick twisted chord in between two thin ones in the El Escorial panel. 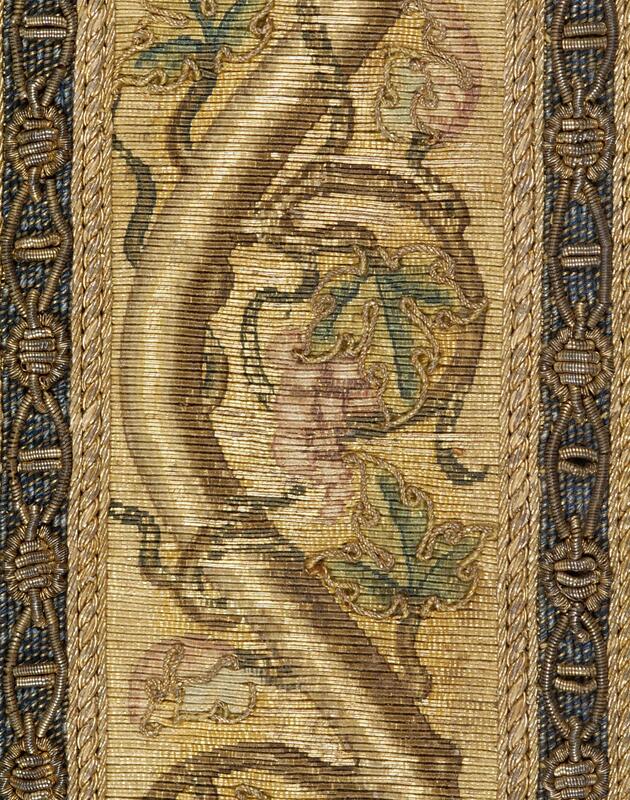 The embroidered braid, a central meandering branch with vine leaves, appears to be the same on both panels. belonging to the set of the Life of Christ in the sacristy of El Escorial. We do not know the dimensions of the de Farcy embroidery but, because the design of the border is identical to the one of the borders of the Krefeld and the Le Puy embroideries, for which we know the dimensions, we can attempt to estimate its size by using the oval and round links of the inner thin braid as a measuring unit. The mean length of the “oval plus round link” unit estimated from the Krefeld and Le Puy embroideries is 1,87 cm. The number of unit links of the de Farcy panel is 13 for the height and 10 for the width, which corresponds to 24,3 by 18,7 cm, very close to the values measured for the orphrey on the back of a chasuble of El Escorial. The above observations lead us to conclude that the Krefeld embroidery is indeed a fragment of the orphrey of a cope fabricated during the last quarter of the XVIth century at the workshop of the Real Monasterio de El Escorial in Spain. By the same token, the de Farcy embroidery is a fragment of an orphrey from the back of a chasuble fabricated during the last quarter of the XVIth century at the workshop of the Real Monasterio de El Escorial in Spain and, more precisely, of the upper panel of such an orphrey. * The authors wish to express their thanks to Ms. Annie Carlano, Director of Craft + Design at The Mint Museum, Charlotte, NC, and to Mrs. Charlotte Lacaze, Professor Emerita, The American University of Paris, for their useful comments and for reviewing the English version of this paper. They deeply thank Ms. Pilar Benito Garcia, Curator, Patrimonio Nacional, Spain, for allowing them to access the liturgical vestments stored in the sacristy of the church of the Real Monasterio de El Escorial and her assistance in the course of this research. Uta-Christiane Bergemann: Europäische Stickereien on 1250-1650, Schnell and Steiner, Regensburg, 2010, p. 84, p. 102-104. Technique consisting of covering the ground fabric with strands of gold thread couched and tied down at both ends; the embroiderer then fixes the threads in pairs by crossing them with silk stitches of varying density. The shimmer of the gold through the silk becomes part of the design. Inverse split stitch, going in the opposite direction to normal shaded gold (or nué) and made on top of it. Used for working flesh tints. A thick silk or metal thread made of several twisted strands. Flattened metal strip wrapped loosely around a thick colored silk core. A metal thread made into a spiral, resembling a small spring with more or less tight or loose coils. A metal strip made into a spiral, resembling a small spring with more or less tight or loose coils. 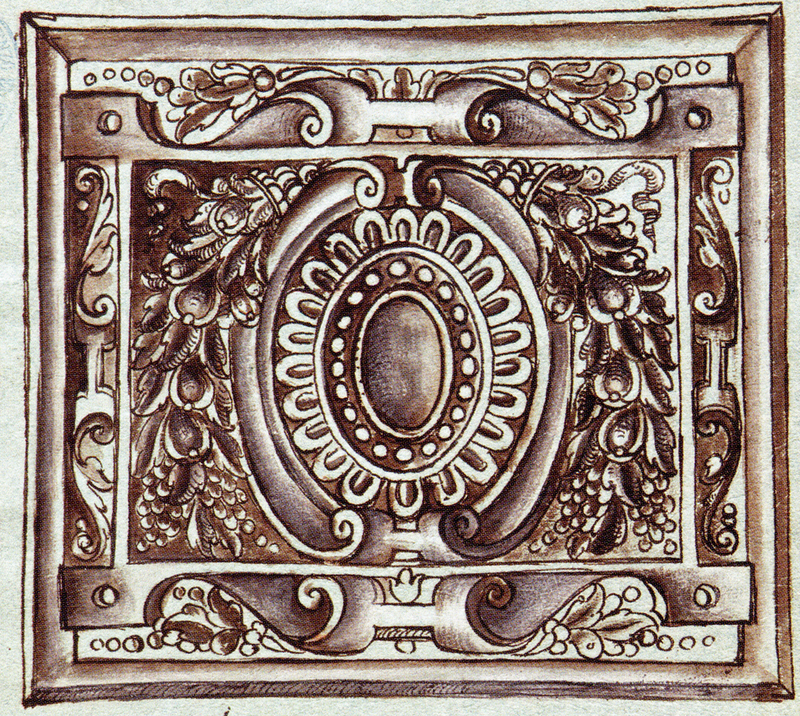 « Portion d’un orfroi espagnol, collection de M. Spitzer / Voici un chef-d’œuvre d’or nué : voyez cette ravissante bordure de vigne, si bien nuancée dans une largeur de quelques centimètres ; le cartouche au-dessus de l’Annonciation est de toute beauté ». Louis de Farcy, La broderie du XIe siècle jusqu'à nos jours d'après des spécimens authentiques et les inventaires, Angers, Belhomme, libraire éditeur, 1890, p. 132, pl. 90. Josiane Cougard-Fruman & Daniel H. Fruman: Le trésor brodé de la cathédrale du Puy en Velay, Albin Michel, Paris, 2010, p. 74-77, p. 253-254, n° 17. In Spanish "caidas de altar". These are rectangular bands that were placed on each side of an altar and framed the antependium (altar frontal). "terno rico de la infancia de Jesús"
 Personal communication by María Barrigón Montañés, Curator, Patrimonio Nacional, Madrid, Spain, 2012/07/06. Paulina Junquera de Vega: “El obrador de bordados de El Escorial”, in IV Centenario de la Fundación del Monasterio de San Lorenzo el Real - El Escorial - 1563-1963 , Patrimonio nacional, vol. II, p. 581. "Herodes encamina a los Magos hacia Belén"
 “Herodes encamina a los Magos hacia Belén”. Junquera de Vega, op. cit. (note 16), p. 581. Diego Angulo and Alfonso E.Pérez Sánchez, “A corpus of Spanish drawings” Harvey-Miller, London, vol. 1, p. 74, plate LXXXVII. Fernando Checa (under the direction of), De el Bosco a Tiziano – Arte et maravilla en el Escorial, Catalogo, Patrimonio Nacional, Septiembre 2014 – Enero 2014, p. 224-225, Fig. 127-131. Diego Angulo, op. cit. (note 223), p. 48 and following. Fernando Checa, op. cit. (note 24), p. 224-05. Junquera de Vega, op. cit. (note 16), p. 565. Inv. 10050180 for the front and Inv. 10050181 for the back. Exhibition catalogue: IV Centenario de la Fundación del Monasterio de San Lorenzo el Real - El Escorial. 1563 – 1963, Madrid, Patrimonio nacional, vol. 1, p. 156, n° OS 3.